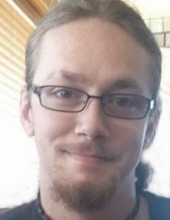 Brent Michael Woods, 26, passed away on November 8, 2018 in Georgetown, Kentucky. He was born November 14, 1991 in Georgetown to Shane C. Woods and Mary Janice Brumback Kestler. He cared for his children full time. He enjoyed gaming and blacksmithing. He is survived by his children, Gatlin Woods and Attolie Woods; his father, Shane Woods (Jennifer Mullikin) of Lexington; his mother and step father, Mary and David Kestler of Georgetown; sister, Kiley Woods of Lexington; paternal grandparents, Bobby and Deborah Woods of Georgetown and Carol and Bryan Cummins of Lawrenceburg; and a host of uncles, aunts, and cousins. He was preceded in death by his maternal grandparents, Jack and Wyona Brumback. Funeral services are 2pm Wednesday, November 14, 2018 at Tucker, Yocum, & Wilson Funeral Home with Pastor Chuck Mericle officiating. Burial will be in Midway Cemetery with pallbearers being Andrew Wagoner, Austin Fogle, Steven Cook, Stevie Fogle, Conner Woods, and Cain Kinard. Visiting hours are 5-8pm Tuesday, November 13, 2018 at the funeral home. To send flowers or a remembrance gift to the family of Brent Michael Woods, please visit our Tribute Store. "Email Address" would like to share the life celebration of Brent Michael Woods. Click on the "link" to go to share a favorite memory or leave a condolence message for the family.